While Sunday drivers can sometimes be a hazard on the road, Sunday bakers tend to create moments of joy around themselves. Or maybe that's what I like to believe! 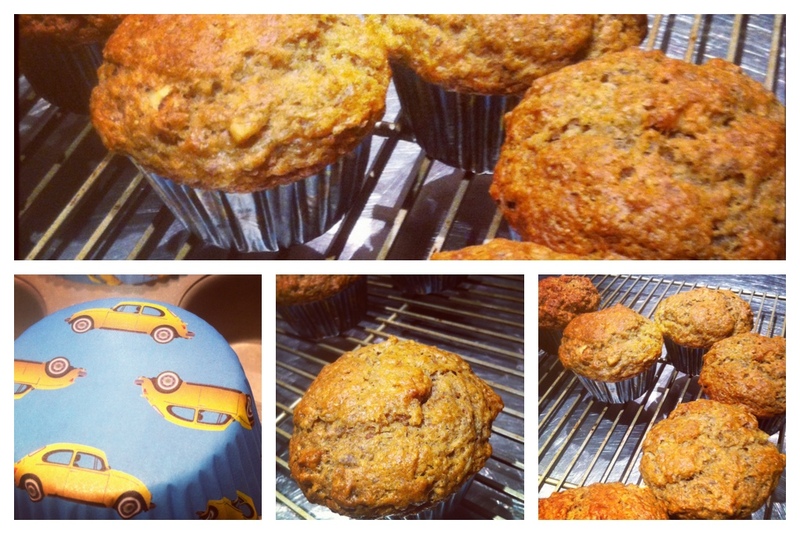 Yesterday, I made my banana walnut muffins since I had four over-ripe bananas...in my freezer. Indeed, that is where I like to store my black bananas instead of throwing them away. The trick is to simply remove them from the freezer an hour before baking. Pre-heat the oven at 350F. In a large size bowl, mix the bananas, butter and egg together and set aside. In a medium size bowl, combine the flour, brown sugar, ground flax seed, walnut, baking soda, baking powder, nutmeg, cinnamon and salt. Add the dry ingredients to the banana mixture and blend thoroughly. Pour into greased muffin tins and bake for 20 minutes.